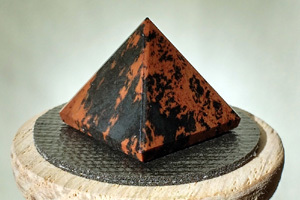 Mahogany Obsidian Gemstone Pyramid for Sale. Small Mahogany Obsidian Gemstone Pyramid as Capstone for Copper Meditation Pyramids. Base (Root). Obsidian is truth-enhancing. A strongly protective stone, it forms a shield against negativity. It blocks psychic attack and absorbs negative energies from the environment. Obsidian draws out mental stress and tension. It stimulates growth on all levels, urging exploration of the unknown and opening new horizons. Brings clarity to the mind and clears confusion. Helps you to know who you truly are. Obsidian dissolves emotional blockages and ancient traumas. Promotes qualities of compassion and strength. Obsidian aids the digestion and detoxifies. It reduces arthritis pain, joint problems and cramps. Warms the extremities. In particular, Mahogany Obsidian has a gentle energy that resonates with the earth which helps us in grounding and with protection. It can strengthen and stabilize an otherwise weak aura.